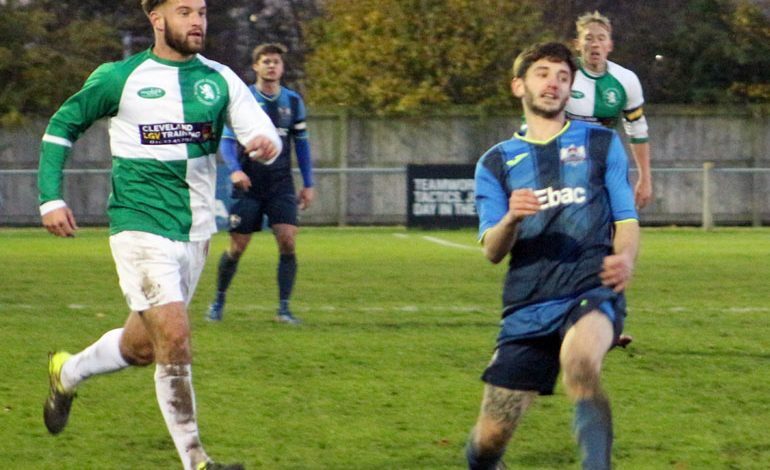 Newton Aycliffe took three points and scored three goals against bottom-of-the-league side Billingham Synthonia. The first 30 minutes was hard work for players and spectators alike. With both sides struggling to create chances the game was becoming bogged down in midfield. However, as the game progressed Aycliffe began to look more threatening. After 35 minutes a Stuart Banks free kick from the left wing was met by a flick from Marc Costello but off target. Two minutes later another free kick, this time taken by Glen Lane was fired straight at Synners keeper James Dawson. Three minutes before the break Kurt Matthews broke from defence playing a ball forward to Paul Kane but Dawson beat him to it. The home side’s pressure paid off with a goal on the stroke of half-time. Jamie Davis played a ball through to Craig Hutchinson who did well to get a cross over to Glen Lane whose shot gave the Synners keeper no chance. Aycliffe began the second half as they finished the first. Three minutes into the half a ball into the box was chested down by Paul Kane into Hutchinson’s path. The Aycliffe forward fired a low shot home to make the score 2-0. Synners tried to respond and on 55 minutes saw a long-range free-kick hit the Aycliffe crossbar. However, a few minutes later Hutchinson again had the ball in the Synners net. Kane beat the defence and crossed to Hutchinson whose shot beat the keeper but not the offside flag. There was a suggestion that Kane had played the ball backover to Hutchinson but the officials weren’t convinced. Aycliffe put the game beyond doubt on 67 minutes and once again Hutchinson was instrumental in causing the damage. The man-of-the-match met a cross with a shot which found the net despite Dawson getting a hand to it. Despite the 3-0 win the game ended on a worrying note for Aycliffe. Sean Tarling came on as a late substitute but within a few minutes he picked up a nasty leg injury. The game was stopped for over 10 minutes as treatment was administered on the pitch with the popular former skipper later taken to hospital. The Synners match was Aycliffe’s sixth consecutive home game in three weeks. They now face away games at North Shields on Wednesday (November 22) and Sunderland RCA on Saturday (November 25) before returning to Moore Lane Park on Saturday December 2 when the visitors will be Jarrow Roofing.